About Us - Misensor Tech (Shanghai) Co.,Ltd. 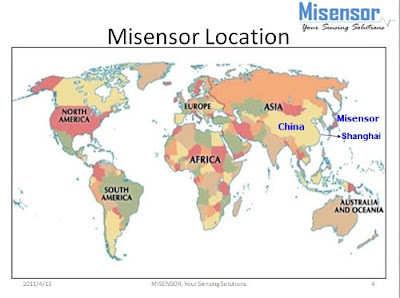 Misensor is a highly innovative leader in the Position and Movement Sensor Solutions using Reed Switches, Hall effect and MR technology. Our production base is located in Shanghai, China. We produce a wide range of Proximity switches, Door magnetic switches, Float level switches, Flow switches, Flow sensors, Fuel Level sensors, Thermal reed switches, Displacement sensors, Elevator Magnetic Reed Switches, Reed relays and Reed switches for the applications of automobile, household appliances, security, test and measurement, medical and industrial field. Our many years of experience and the expertise of our employees ensure competent service over our entire product line of standard items, as well as the development of customers' specific items according to customers' specific requirements and applications. Founded in May 2010, and the founders have more than 10 years experience in Reed Switches and Sensors. Our technical knowledge, expertise of reed switches and magnets insure competent service with excellent quality and very reliable products of reed sensors. Our journey has taken us on to other technologies including hall effect, MR, optical and ultrasonic. Our team members have the long years of experience in the reed technology leader companies and know how to produce the high quality sensors. Our location is in Shanghai, and Shanghai is China's most comprehensive industrial and commercial city, ranking the first in population and population density. We have unique capabilities of reed technology. Assigning unique P/N insuring parts are made to specification everytime. your switching and sensing problems. Misensor Tech (Shanghai) Co.,Ltd. is a China Leading sensors manufacturer. Product range: Proximity Sensors/ Level Sensors/ Float Switches/ Displace Sensors / Thermal Sensors / Reed Switches / Reed Relays. Applications: Automotive/ Domestic Appliances/ Security/ Industry/ Miscellaneous applications etc.